Do you often check statistics of your posts on digg? If yes, then here is a best tool for you known as Digg Alerter. Digg Alerter will automatically check your posts statistics on digg. It will show you who dugg your posts and who commented on your posts. Digg Alerter is very easy to use. Just fill in user name of your digg account. It doesn’t require any password so you can also check statistics of your friend’s posts. It will save a lot of your time as you don’t need to check each post manually. 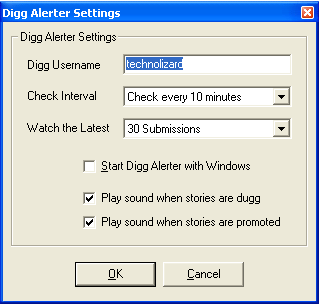 Digg Alerter can check maximum 100 latest submissions. As you can see in the screenshot below, it will show the list of people who dugg your posts in the right sidebar and comments in the bottom bar. Digg Alerter will play a sound whenever your stories are dugg or promoted.